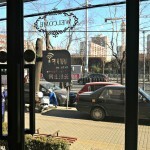 « Day 191 in Beijing: Five Things I’ve Gained By Being In Beijing. Day 192 in Beijing: Z. Y. S. Pasta Factory. Z. Y. S. Pasta Factory recently opened about three blocks from our house. As mentioned before, I have never seen a city turn over stores, restaurants and businesses as quickly as they turn over in Beijing. We hope this one stays around for a while as we have started going there a few times a week. The food is Italian, as one might supposed by the name, and it is quite good. 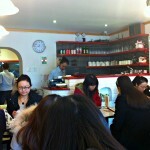 The staff is incredibly nice and one of the waitresses named Tao Tao, speaks incredible English. There is the I.E.B. University across the street so there are a lot of students here and some expatriates. Therefore, knowing English is a useful tool for someone living in here if they want to meet and work with the students. Tao Tao is from a different province and we have yet to find out why she is here and we are guessing it is for school. We will try to find out next time we go. The first time we came in she sat us down and started speaking English to us. At the end of the meal, she asked us, “Are you professors?” I laughed because we were probably the only people over 25 in the restaurant and we are definitely too old to be students and told her that I work as a Marriage and Family Therapist for a company in Beijing and Jill runs her own websites, San Francisco Tourism Tips and All About Red Wine. She smiled and thanked us for talking to her and coming there for dinner. We have seen her, and talked to her, each time we’ve gone and it has been thoroughly enjoyable each time. Something that I enjoy is hearing different languages spoken. Again, since there is an university nearby, there are a lot of people, from different cultures, that come here to study. During our latest visit, we heard English, Mandarin, Chinese and Russian. A nice collection of languages for a place that probably can’t hold more than 25 people at the most. The view outside. This is about the 10th day in the row of gorgeous weather! People enjoying themselves and Tao Tao at the register. This couple had a conversation in English, Mandarin and Russian without pausing in between sentences. Amazing.